"Valuing Birds Research Key_Finding2.jpg" "Valuing Birds Research Key_Finding4.jpg" "Valuing Birds Research Key_Finding4.jpg" "Valuing Birds Research Key_Finding5.jpg"
and whether the values held for particular species of threatened birds affect the success of strategies used to conserve them. The inquiry is situated within the discipline of social psychology, social constructionism theory and the field of human dimensions of wildlife research. It is informed by Kellert and Clark’s (1991) wildlife policy framework and Kellert’s ‘attitudes towards animals typology’. An interpretive, mixed-methods approach examined values held by different sectors of Australian society. 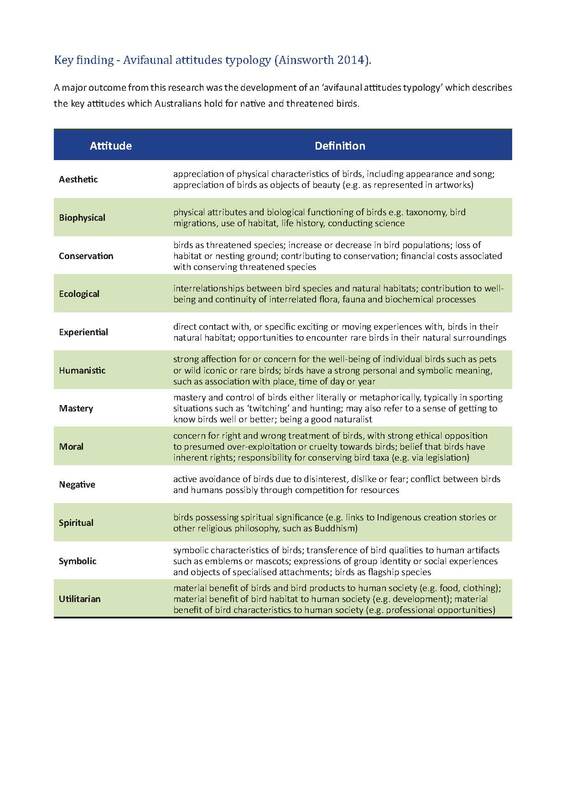 A new typology of 12 avifaunal attitudes was developed to describe the different ways Australians value birds. 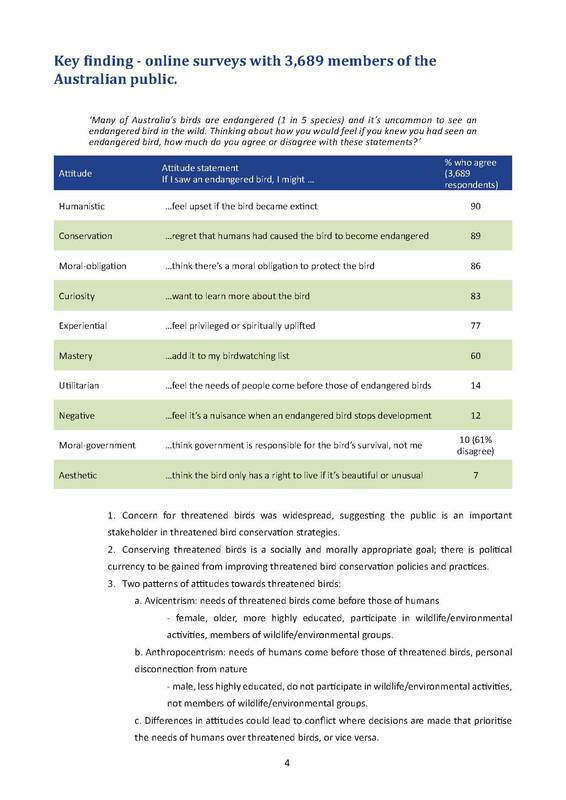 Three quantitative online surveys of 3,818 members of the public examined Australian attitudes towards threatened birds. 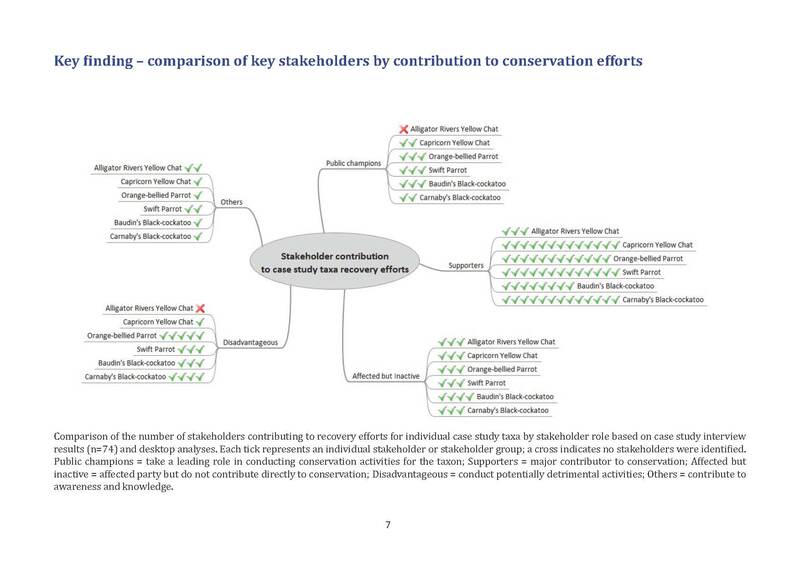 Three qualitative case studies (three matched pairs) of Australian threatened birds investigated the opinions of 74 key informants about the influence of stakeholder values, and those of other sectors of society, on threatened bird conservation. This research demonstrates the importance of understanding how social factors influence wildlife policies and processes relating to threatened bird conservation. It highlights consequences associated with privileging scientific values in the conservation process. The findings reveal how the social constructions of threatened birds and the issues affecting them influence societal interest and conservation investment. 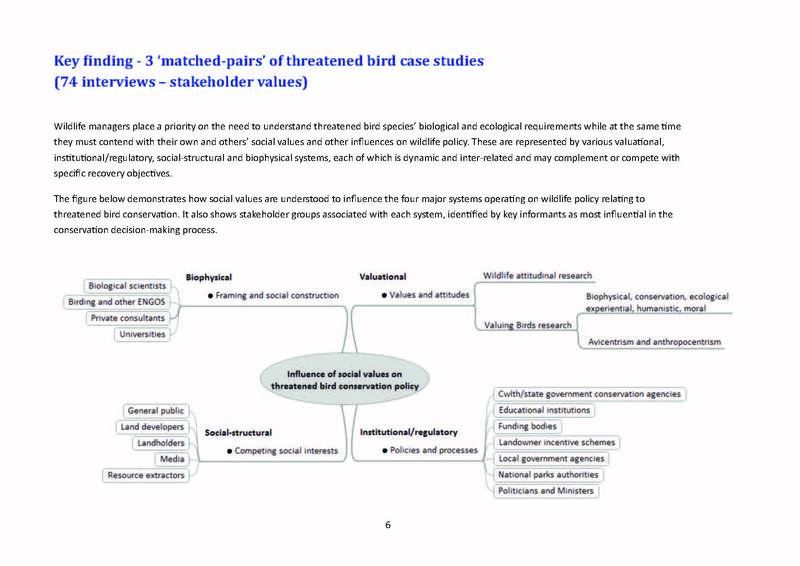 The results provide decision-makers with insights into developing effective frames to convey a broad range of threatened bird values to policy-makers and society. The thesis was very well received by all three examiners, with two placing it in the top 5% of theses they have examined.